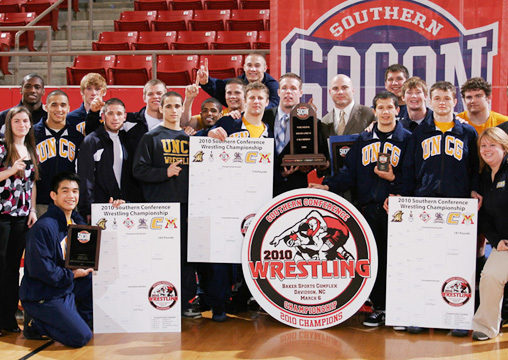 The wrestling team celebrates winning the SoCon Championship and advancing to the NCAA tournament. In fall 2009, Spartan Athletics was pleased to welcome former Florida State University and University of Virginia associate athletic director Kim Record as its new director of intercollegiate athletics. Throughout the year, athletes from every sport provided spectators with exciting moments as they excelled in competition, in the classroom and in service to the community, giving their time to causes from Haiti Relief to Relay for Life to Fox 8 Gifts for Kids. Take a look at some of the most outstanding accomplishments for Spartan Athletics from the 2009-10 seasons. Men’s Basketball enjoyed an exciting season featuring powerhouse competition and a home court setting at the Greensboro Coliseum. Forward Ben Stywall earned a number of honors, including being named to the all-state squad’s first team by the North Carolina College Sports Information Association and became the first Spartan to ever average a double-double. Read the latest about men’s basketball recruiting and more. Women’s Soccer won their fourth straight regular season title and enjoyed an unbeaten streak of 33 straight regular season wins before losing. Only nine schools have ever gone unbeaten in three or more consecutive conference seasons in women’s soccer history. The team was also honored with the National Soccer Coaches Association of America’s Team Academic Award. The Wrestling team won the SoCon Championship and sent four wrestlers to the NCAA Championships in Omaha, Neb. Men’s Tennis won the SoCon Men’s Tennis Championship and earned a berth in the NCAA tournament for the first time ever. Softball pitcher Amber Harrell became the new Spartan leader in career strikeouts, breaking the team record in April. Golfer Sofia Aidemark, a senior from Lahholm, Sweden, was inducted into Phi Beta Kappa and boasted a 3.97 GPA in communications. Aidemark, who was also honored as the Southern Conference Student-Athlete of the Week, is the first international student in school history to be inducted into the society.